Mikey Brannigan Wasn't Allowed to Compete in College. Now, He's Going for Gold in Rio. 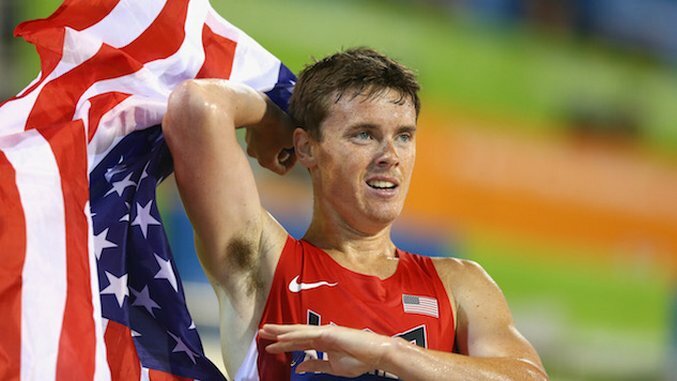 For Mikey Brannigan, the big race in Rio is just the latest stop in an already unprecedented journey. Brannigan, a lanky 19-year-old Long Island native, is one of America’s fastest milers. Unlike many of his competitors in races throughout his short career, however, he has autism. Edie Brannigan, Mikey’s mother, said that she and her husband knew he had autism when he was 18 months old; he was officially diagnosed at two. Edie described her son as a “peer modeler” because he tries to overcome his autism in social settings by mimicking the people around him. Kevin Brannigan, Mikey’s father, met Steve Cuomo when his son was seven years old. Cuomo told Kevin about Rolling Thunder, a running club he founded and coached that allows disabled athletes as young as five years old to train and compete with able-minded athletes. Mikey’s parents quickly signed him up. Through Rolling Thunder, Mikey began competing in road races as a young boy. These races gave a glimpse at the runner’s future success. “First Mikey was coming in like 200th. Then Mikey was coming in like 100th. Then Mikey was coming in 50th. And then Mikey was coming in 20th. Well the next thing you know, Mikey’s winning every road race he goes into, practically,” Edie said. Mikey quickly picked up a love for running and racing. Edie thinks that her son’s autism has allowed him to progress as a runner without the inhibition of self-doubt. Mikey continued running at Northport High School, where under Jason Strom’s coaching he became the school’s top runner and one of the elite New York high schoolers. Mikey’s talent reached the national level during his senior year, when he competed in invite-only fields against the country’s best high school runners at the Prefontaine Classic, the Adidas Dream Mile and the Brooks PR. James Burke, a sophomore runner at Georgetown University who grew up in nearby Port Jefferson, New York, got to know Mikey growing up as the two met regularly in youth and high school races. “We were both studly eighth graders in the same county. It was fun coming up at the same time as him,” Burke said. Thanks to New York’s system for track and field state championships, in which athletes represent their counties instead of their individual schools, Mikey and Burke would sometimes be teammates representing Suffolk County. Burke said that for trips to the state meet, he’d ride the bus and share a room with Mikey. That determination is on display in Burke’s favorite story about Mikey. Burke said that after Mikey had a disappointing run at the 2014 Nike Cross New York Regional race, he asked his coach if they could try and run at the Foot Locker regional race held that same day. The running success was matched by accomplishments off the track. Mikey took and passed Algebra I despite school faculty initially steering him away from the class. To top it all off, Mikey was crowned Northport High’s Prom King his senior year. Mikey’s success on the track during high school drew interest from more than 200 college teams, including Georgetown University. “So we generally start the recruiting process in the fall or the winter of their junior year. I was just reaching out to him as I would any other really, really talented junior,” Georgetown Cross Country Head Coach Brandon Bonsey said. Bonsey went through the initial stages of the recruitment process with Mikey, but decided to stop after learning more about the runner’s backstory. The coach said he was worried that Mikey would struggle academically at Georgetown, and the he wasn’t sure the school would provide enough support for Mikey in the classroom. Division I running never came to be for Mikey. Because Mikey struggles with standardized testing like the SAT, he was unable to meet the NCAA’s academic standards. This prevented him from competing at the collegiate level despite the fact that Mikey was accepted into individual colleges. Edie said that some schools, like American University, Hofstra University and Duke University, were prepared to provide Mikey with the support that Georgetown couldn’t if the NCAA would make an exception. But his running career would not be stopped by NCAA rules. Now coached by Sonja Robinson, Mikey runs for the New York Athletic Club while attending Suffolk County Community College part-time. Robinson says that they are currently pursuing sponsorship deals for Mikey. Robinson said that she is happy with the runner’s progress over the past year and that he is probably farther along than many of his collegiate peers. Still, she’s quick to point out that Mikey was essentially forced to go pro. Mikey’s first year as a professional runner has been a learning experience for both him and Robinson. From a coaching perspective, Robinson says that for the most part coaching Mikey is like coaching any other runner, but there are slight differences. Mikey’s training since high school has included multiple stays at the U.S. Olympic Training Center in Chula Vista, California. Robinson said that her bond with the runner really strengthened through those trips. Mikey represented America last October in the T20 1500 meter run at the 2015 IPC Athletics World Championships in Doha, Qatar. For Paralympic competition, the track athletes with intellectual impairments compete in the T20 division. He ran 3:56.50 to edge out Iran’s Peyman Nasiri Bazanjani by a fraction of a second. It was a thrilling race; Mikey sat on the shoulder of the defending world champion until pulling away with a home straight kick. The winning time set the championship record. Later at the meet, Mikey won silver in the T20 5000 meter run with a time of 15:50.99. A month ago at Sir Walter Miler in Raleigh, North Carolina, Mikey finished seventh in an elite field with personal best time of 3:57.58. In total, nine men broke the four minute barrier that evening. Race director Pat Price said that he thought the overall strength of the field helped pull Mikey to a break-through race. Price said that at the race, Mikey was a favorite among the crowd and the competitors. Kyle Merber, then winner of the race and a Long Island native, was particularly interested in Mikey’s run. Mikey’s 3:57.58 was reported as a world record for the T20 division; however IPC Athletics Senior Manager Haozhe Gao said that his organization does not keep records for the mile because it is not an official Paralympic event. Price said that in their pre-race research, he and the other race organizers could not find any T20 athlete who had ever broken the four-minute barrier. “He’s the first, and he’ll always be the first. That’s pretty cool,” Edie said, reflecting on the milestone her son achieved. Mikey runs in Rio on September 13. Bazanjani, the Iranian runner he beat at last fall’s world championships, is the defending Paralympic champion. Mikey said that he’s ready for the race. “I feel good, I’m fit and I’m strong. I’m so excited. I’ve been training for this,” Mikey said. Mikey’s parents will be making the trip down to Brazil to watch the race. Robinson said that even though Mikey is the best runner in the field on paper, they have to be wary of the extra experience that his competitors have. She said that this experience is important when considering how unpredictable Paralympic competition is compared to the normal race tactics that Mikey is used to racing against. Edie said that she hopes Mikey’s run in Rio, and all of his accomplishments to this point, serve as an inspiration for the autism community. If everything goes as planned, the Paralympics are not the peak for Mikey. For him to continue progressing, Robinson knows that eventually she will pass him to another coach. She’d like to see Mikey in an elite training group setting, working out consistently with Olympic-level runners. Edie has no doubt that her son will achieve his biggest goals.